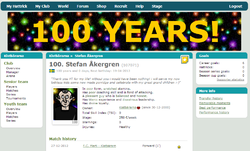 Stefan Åkergren (107071) was the first player to become 100 years old in Hattrick. This happened on the 28th of December 2012. Was heard muttering something about a hundred years is no age. He is currently still the oldest player in Hattrick. 28-12-2012 00:00 Was heard muttering something about a hundred years is no age..
13-03-2007 13:29 Was removed as coach for Kistbärarna. This page was last edited on 21 March 2013, at 11:12.